This one of those models that I have always fancied but never really found justification for the expense of the available models of this type (I'm very "cost efficient"). Just after Christmas 2014 and armed with a good amount of cash from relatives for my crimbo prezzies, I decided to have a good root around E-bay for something that may catch my eye. It was then that I saw the advert for this model. Its an older 1990 model and was a second hand kit, sold as seen. I decided to take a chance and bought it for a very reasonable £15. I offset the risk that all the parts may not be there by deciding on creating a crashed huey diorama to disguise any missing parts. I was pleasantly surprised to find that the model was in excellent condition despite its age and storage and even better, all of the parts were there! I quickly purchased a helicopter crew from academy as the kit ones were dire in their quality and put the kit onto the shelf until I had the time to start it. After some intensive searching on the internet I managed to find an Eduard interior set for £10 so that's been ordered to cut down my work load for detailing. When it arrives from Poland I will begin work on the front portion of the cabin and cockpit. Moving on to the interior of the cabin and work was not much easier there! The doors were easy enough to fit the etch pieces to, however the display was a much bigger problem. The kit part was quite a lot smaller than the etch set piece. In addition the kit part was bloody awful in terms of detail so really needed the lift from the etched part. 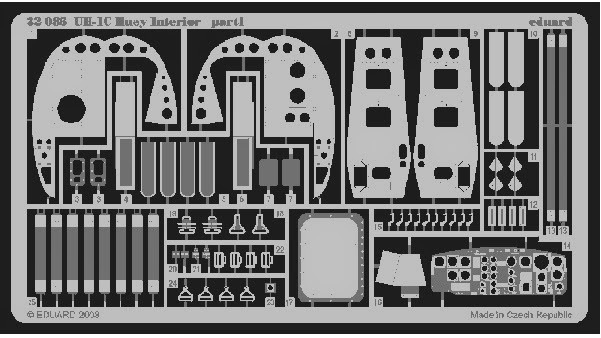 I decided to make a complete new part that would house the etch set and provide the detail that I felt was needed for the "nerve centre" of this aircraft. I will also be adding some more scratch built details to the rear of this binnacle when I re-visit it for correct part placement before final assembly. The other etch parts for the interior I had a little more luck with. The detail parts for the internal pillars between the doors fitted almost perfectly and the internal structure at the nose of the aircraft fitted as though it was intended for this particular make of kit. I did decide on building a new rear bench however. The kit supplied part was again badly represented and lacking in detail for me. This was sorted by some more stock plastic card and rod followed by the etch seat belts and harnesses supplied with the etch set. work is still progressing with the interior however I didn't realise just how complex a build this was going to be with the retro fitting of the etch parts and the inevitable part fitment problems that is almost always associated with this age of kit. I also ran into a problem with the fitment of the crew figures into the seats. I should point out that this is entirely my error as the seats were scratch built items. I solved the problem with a dremmel and a lot of ground plastic on the workbench to clear up afterwards! I have also finally began putting paint to plastic as well as starting the assembly process.The progress shots are shown below.